How fun! He’s a funny little guy, isn’t he?!?! TFS! Hahahaha! Cute! Yes, those clouds do seem pretty pleased. Tickled my funny bone, Susan! OK, I’ll be the one to say it…..”what did the fox say?” LOL He looks cross but cute, and I love those smiling clouds!! Oh my he doesn’t look to happy indeed, I love the way you cute the sky on an angle, that is such fun paper to go with him!! Well I am not too happy about the snow forecasted for today so the fox and I have something in common! Love your card! This is adorable. Love that little fox and the fun DP you used. This card is so absolutely charming! I love how it has such great emotion and tells a story. 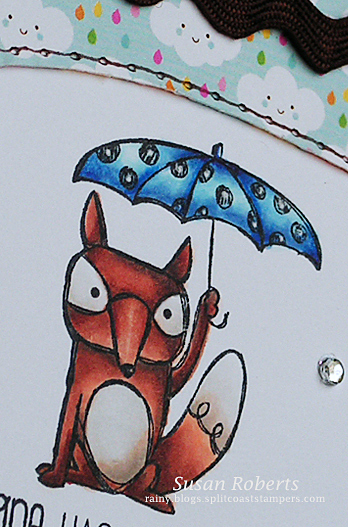 The adorable disgruntled fox looks fantastic with those happy clouds! I love the whimsical feel you gave this and love how the black plays with those great colors. 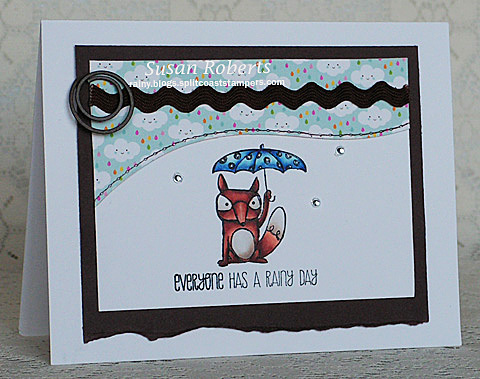 Thanks for creating such an enjoyable card to see and for sharing it with us for this week’s Simon Says Stamp Monday Challenge! I love the paper you’ve used with the smiley clouds!!! Such a fun card. Thanks so much for playing along with ASM this week!